Try this simple cake in the morning with coffee or in any other moment of the day. Close your eyes and feel the thin layer of orange marmalade under the crispy chocolate glaze, and then the full texture of the cake with orange zest and orange juice. You won't be sorry. I even had this cake tasted by Gaetano's collegues at work - no comments, only an empty container and complaints by those who didn't get there quickly enough to try it. Place butter, sugar and finely grated orange zest in a mixing bowl and beat until light and fluffy. Add eggs, one at a time, mixing continuously. In the end, add flour and baking powder sifted together. Pour the batter into a loaf pan lined with baking paper. Bake in an oven preheated to 200°C for 1 hour. Let it cool completely. 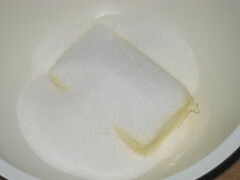 Cut the cake lengthwise into 1cm thick slices. 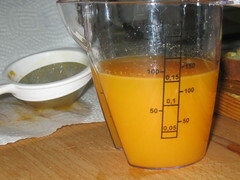 Squeese the juice out of oranges and moisten the cake slices on both sides. Melt the chocolate with 1-2 tablespoons of water. Spred the chocolate on each slice to join them and reconstruct the cake again. Let the chocolate to set and then spread some orange marmelade on top. Coat the cake with chocolate glaze. I was too lazy to make my own, I just used the store bought one - but if you want to make your own, here's my suggestion: melt 100 g dark chocolate on low heat with 2.5 tablespoons of sugar and 2.5 tablespoons of milk. Remove from heat and add 70 g butter. An extra idea. Cakes are nice, but I find cupcakes just irresistible. 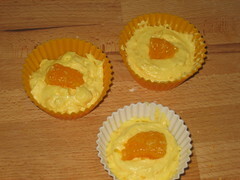 Fill the cupcake moulds with the same batter, place a piece of orange on top and press lightly. Bake and leave to cool. Dip into chocolate glaze and decorate with orange zest cut into tiny stripes. Miješajte mikserom maslac sa šećerom i sitno naribanom koricom naranče. Dodajte jaja, jedno po jedno, neprekidno miješajući, i na kraju obje vrste brašna prosijane s praškom za pecivo. Ulijte u namašten i pobrašnjen dugački kalup. Pecite 1 sat na 200°C. Ostavite da se ohladi. Izrežite kolač na listove široko oko 1 cm i natopite sokom od naranči. Ottopite čokoladu s 1-2 žice vode, nanesite na listove i slijepite ih tako da stoje okomito. Premažite površinu kolača tankim slojem pekmeza od naranči i potom prelijte čokoladnom ocaklinom. Za ocaklinu otopite 100 g čokolade za kuhanje s 2,5 žlice šećera i 2,5 žlice mlijeka. Dodajte 70 g maslca i miješajte da se sve otopi. Prelijte kolač. Da bi lakše rezali kolač preliven čokoladnom ocaklinom, umočite nož nekoliko minuta u vruću vodu. Sbattete il burro con lo zucchero e la scorza di arance grattugiate. Continuando a sbattere, aggiungete le uova, uno alla volta ed incorporate bene tutto. Setacciate insieme la farina, fecola ed il lievito e aggiungeteli all’ impasto. Versate tutto in uno stampo per plumcake ed infornate per circa 1 ora a 200°C. Lasciatelo riposare (anche una notte intera) e poi tagliate a fette larghe circa 1 cm. Sciogliete 200 g di cioccolato con 1-2 cucchiai di acqua. Bagnate le fette di dolce con il succo di arance e poi spalmateci cioccolato, unendo poi le fette tra di loro e cosi ricomponete di nuovo il dolce. Passate 2 cucchiai di marmellata di arance al setaccio per rimuovere le scorze e spalmatela sulla superficie del dolce. Preparate la glassa di cioccolato con 100 g di cioccolato, 2,5 cucchiai di zucchero, 2,5 cucchiai di latte e 70 g di burro (oppure usate la glassa pronta a vostro piacere) e ricoprite tutto il dolce. 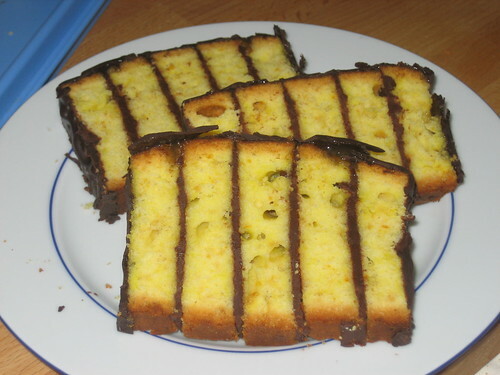 Con questa torta partecipo alla racolta di ricette Ci piace un sUcco di Tzatziki a colazione, ricette dolci e salate a base di agrumi. The cake is for sure for any chocolate lover, and what I love the most about this cake is you have alternated the chocolate layers with cake slices, which makes the cake luxurious and even yummier. 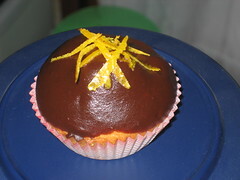 Orange and chocolate are such delicious flavors to pair together. I love all those layers of chocolate! And the next thing I'm making will be Chocolate and pear cake, another "die for" combination. Thank you very much Dajana.